It all began when I was asked if I had seen “THE goats”. WHAT goats? I love goats! I went to look. 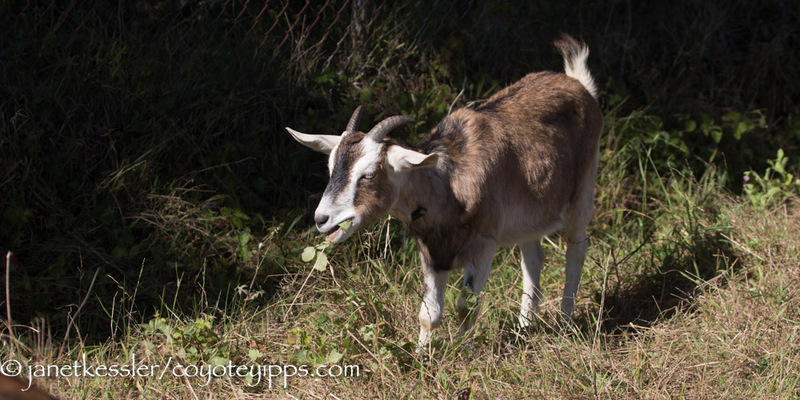 It was in the area where I watch coyotes and I wondered how the coyotes and goats fared in the same area. I spoke with Doug there, the goatherd. He gave me the contact for his boss, Genevieve. 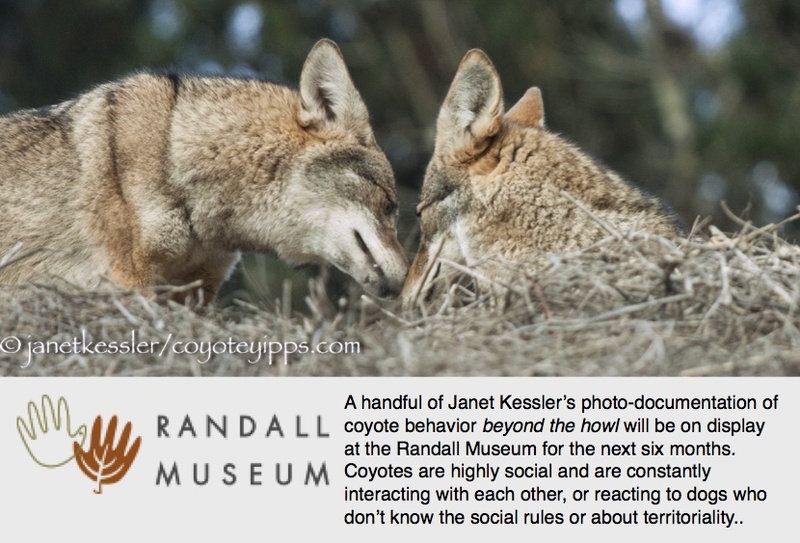 Well, I found out a lot more than just how the goats and coyotes got along, and it was hugely interesting! Genevieve invited me to come watch an unloading of the goats and to meet her at their next gig. I arrived a little early. Soon the big truck with 50 goats arrived. A flurry of energy and activity began. The minute they arrived, before unloading the goats, the team hopped out of their truck and immediately, and minutely, checked every inch of fence-line for any breaks that might have occurred since they were set up the previous evening. Pre-existing fences were made use of, but also portable electric fencing had been installed to create smaller corrals: these light-weight electric fences were supposed to deliver 12 volt shocks, but in actuality, I was told, it was closer to 6 volts. 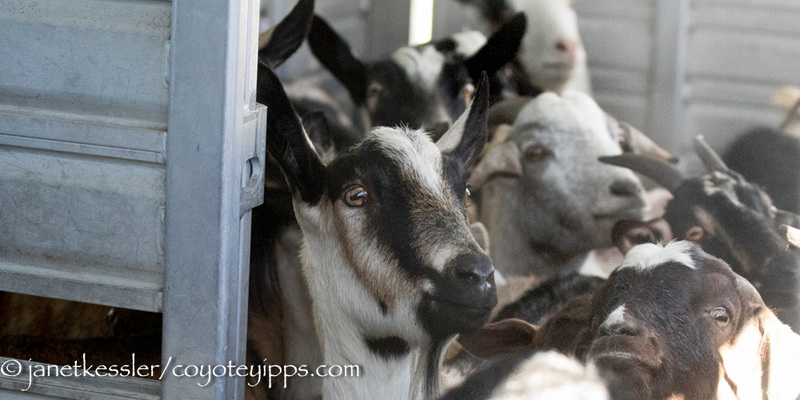 As the crew worked, the periphery having been checked, the goats were unloaded from the truck. The goats rushed in to the green grasses where THEY immediately started “working” — grazing and clearing the ground of weeds and overgrowth. I know some PEOPLE who wish their work involved simply eating! 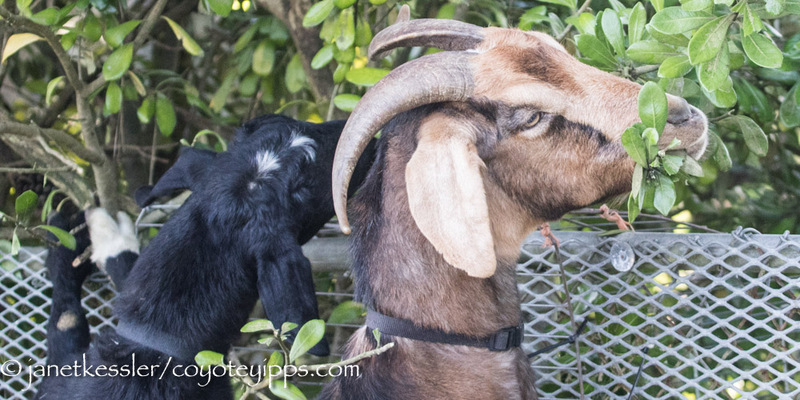 The goats were eager and ate voluminously of everything in their paths, including tree tops which overhang the fence into the area where they were. 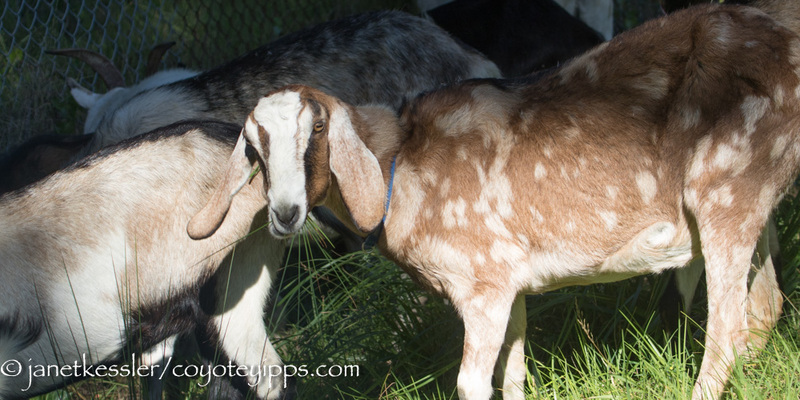 Genevieve uses a variety of goats, including Olberhasl/Alpine mixes, Boer crosses, dwarfs and some Nubians, each of which had a collar and a number. They looked healthy, energetic and happy. Interestingly, whereas sheep are true “grazers” who feed on grasses, goats are really “browsers” who feed mostly on non-grasses: leaves, soft shoots, fruits, shrubs, vines and woody plants. Genevieve runs the operation. She herself is energetic, directed, young, and always in motion. An obvious pro, she was aided by the two herders who were on site that day, Kevin and Doug. The team worked well together and, wow, she worked incessantly. It was fun to watch. Genevieve grew up ranching: she has always been around horses and cows and goats and pigs. She grew up also horseback riding and even almost became a rodeo queen, she said. But then, for the next 20 years she moved into the arts: she was a glass blower! I brought up the name of a glass-blower I knew who was creating conservation pieces. Genevieve immediately reacted to this, saying that glass blowing is one of the most environmentally destructive processes around: it uses toxic chemicals and a huge number of resources. She is a true shepherd, and is thoughtful and caring about sustainability, environmentalism, and humane treatment of the animals. Her herd includes about 100 goats, and she maintains each goat throughout its entire natural life — she even takes in rescue animals. Youngsters and oldsters are not grazed, but fed alfalfa at home and are allowed to live out their entire lives under her care when they are too old to work. 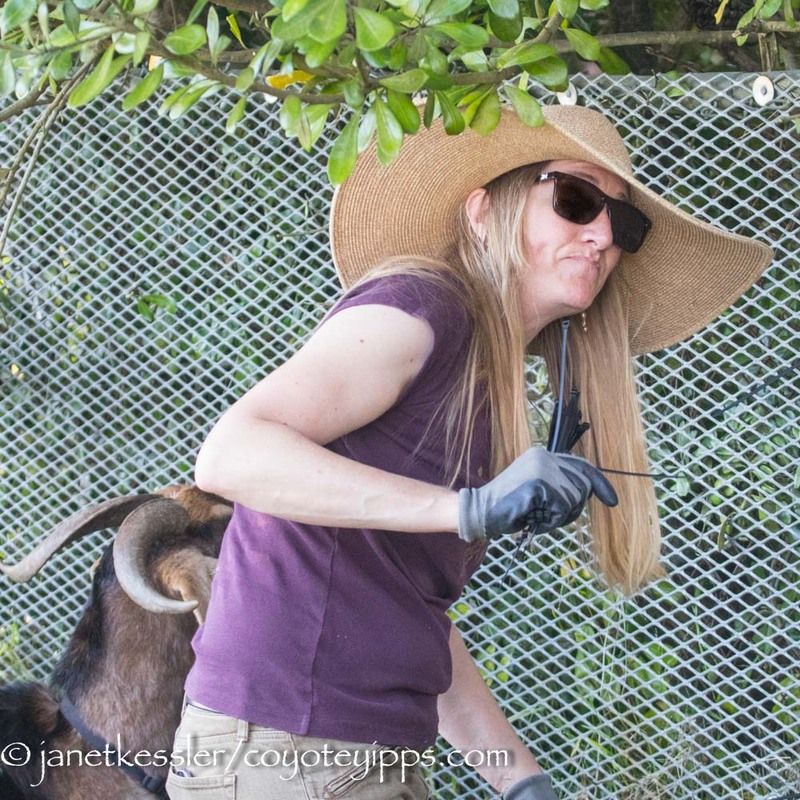 Genevieve began working with the goats about 6 years ago when these goats still belonged to a waste management company: the “purpose” for the goats at that company was fire-hazard reduction — this hasn’t changed. Grazing goats was a sideline of that company which had been in existence for 10 years. They got into goats to prove how environmentally friendly their waste-management methods were, but the goats were very much a sideline for them — they had only half the number of goats she now has. I asked if through clearing out the weeds goats received all the nutrition needed to sustain themselves. She said, “We sometimes supplement with grain/alfalfa or hay on a grazing site — depends on the variety of foliage around.” If the grasses are mostly dried, she uses many goats for a short period of time, and then adds supplements. She is in contact with, and consults with veterinarians at UC Davis for advice as to what is best for the goats. 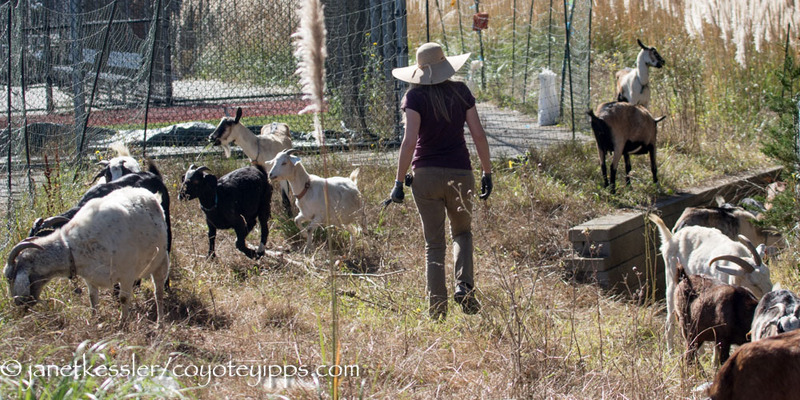 The goats work an area that is roughly a 30 mile radius from SF, and they are constantly busy. 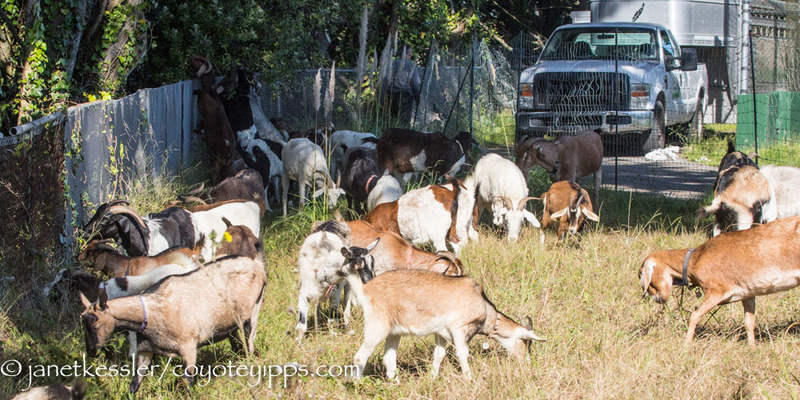 Last year, at the end of 2017, the goat grazing was turned into a non-profit organization, with fire-hazard reduction being its primary mission . Since that time, “business” has boomed. Her operation is based in Bayview. And, what about coyotes and goats? That’s what I had actually come to find out about. She told me that coyotes are not interested in dealing with herd animals. “We wander into their territory and we watch them, and they watch us.” Where she grew up, some of the cats and dogs disappeared due to coyotes, but not the herd animals. Rarely, she said, a very weak individual has been targeted by a coyote, but never in San Francisco. Here, coyotes simply “pass through” areas where the goats are, usually towards about midnight, and outside of the electric fences. 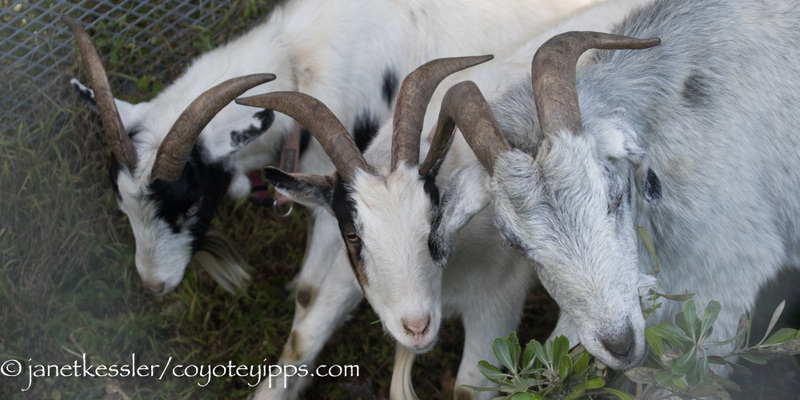 The goats and coyotes look at each other and then the coyotes move on. Occasionally the herder has chased coyotes off and they went quickly. The goatherders are not with the goats 24/7, and when they are, they work in 8 hour shifts. Guard dogs are not used. Her goats are strong and therefore, she says, left alone by the coyotes. Great story Janet! I love that Genevieve keeps her goats for their lifetime, verses slaughtering them when they become too old to work. Goats intrigue me and her clearing business is important to managing our urban environment! Hi Alex — Yes, precisely! What a great story!! And I just love Genevieve. WONDERFUL work with beautiful intentions. Yes, Genevieve has thought things through and acted accordingly. Thanks, Cindie!